We hopped in a taxi outside of our hotel, on the ground level. 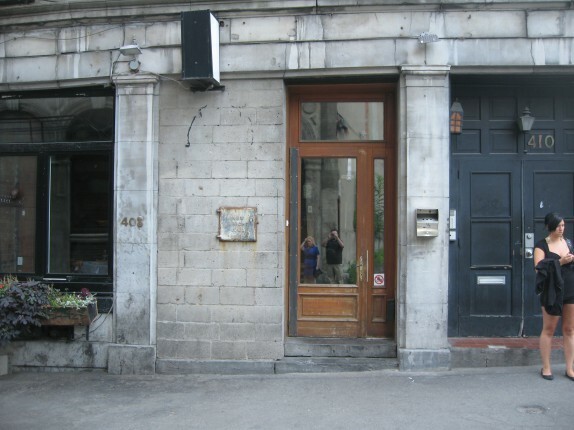 After a quick, 10 minute ride to what people have been calling “Old Montreal,” we arrived at 408 rue Saint-François-Xavier. If you didn’t do your research, you’d have no idea where to even look for the restaurant. Cassie did. 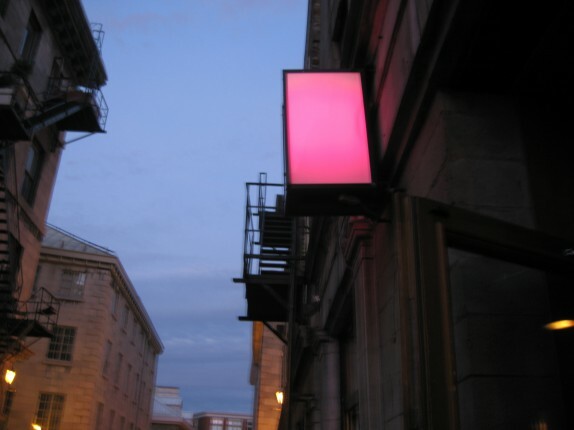 She spotted the pink light box, which is illuminated when the restaurant is open. Closed - White. Open - Pink/Purple. 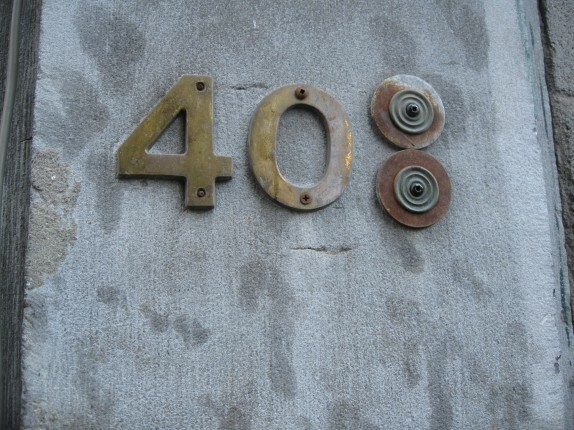 Or you can look at the street number. We were seated in a half booth/half table. Cassie took the booth, and I took the chair. The waitress greeted us and offered to sell us drinks. The special drinks that evening were a berry and lychee puree with vodka (which Cassie had) and a Caesar, which I had. The waitress described the Caesar as being garnished with crab legs. I rashly agreed to have one of these. When it was served to me, I was in awe. There was one problem: it was technically a bloody mary, and I hate bloody marys! I closed my eyes, took a sip, and immediately entered the world of bloody marys. 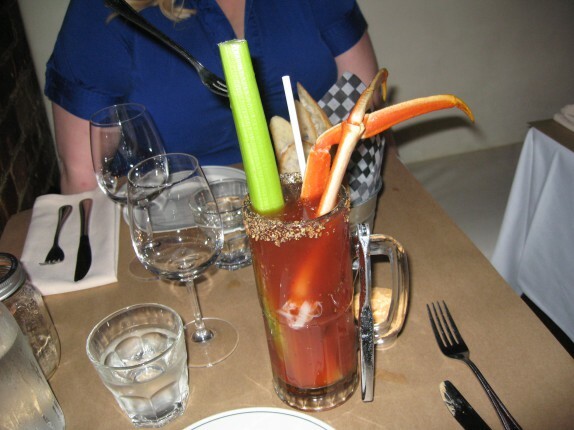 The base of the drink is vodka and clamato, a tomato juice cocktail made with clam juice; this leads to a less thick cousin to a bloody mary. 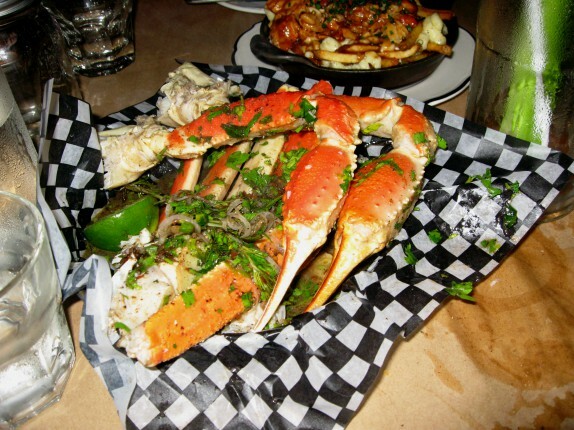 As advertised, it was garnished with monster king crab legs as well as celery, and, on top of that, it was rimmed with Montreal steak seasoning. There was a slight thickness to the beverage, and that was from the freshly grated horseradish helping to spice the drink. Worcestershire and Tabasco sauces rounded out the drink. I was extremely happy. After I drank the whole thing, I remembered I saw Chuck make this on TV. We were also given some bread. I started looking over the menu, which is posted only on a blackboard in the restaurant. The menu was in French. I was able to understand most of the terms, but asked the waitress to explain a couple of items to me. While she was doing so, I discovered that there was an English version of the menu above the bar. My bad. Basically, left side = appetizers, right side = entrees. The music playing in the restaurant was putting me into a trance. On Chuck’s Day Off, music is featured as a focal point of the show and of the restaurant. During the deliberation period, I heard songs not unlike “California Dreaming” by The Mamas and The Papas, “You’re So Vain” by Carly Simon, and various songs by The Beatles. This made it difficult to focus on ordering. Luckily, I had Cassie there to get me focused. We decided to share lobster poutine and Jerk Crab as appetizers. 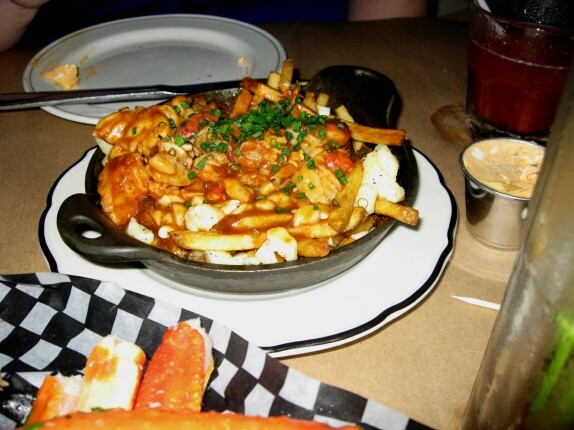 I am going to try my best to describe the constituents of Lobster Poutine at Garde Manger: crispy frittes, gravy made with lobster stock, cheese curds, and chunks of buttery lobster meat, married together in a complexly sweet bowl of perfection. This is the ultimate junk food and the ultimate indulgence. It was rich, decadent, and out of this world. One bite of this alone made the entire trip worth it. I ordered the duck breast. All that was really listed with this dish was chipolini and chorizo. It was a combination I could not pass up. 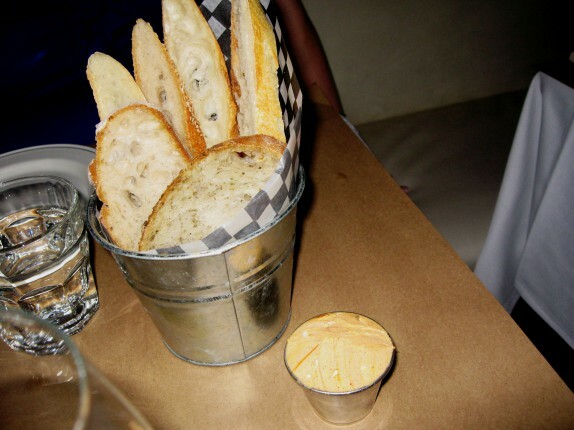 While this dish was very good, it was a fair amount more pretentious than the appetizers and didn’t really stand out among everything we sampled. 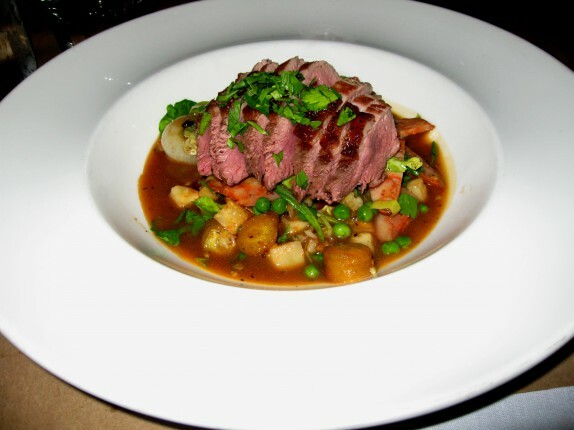 Everything tasted average and as I expected, except, the peas in the dish were clearly freshly picked and brought a bright sweetness to the flavor profile. Again, I didn’t hate this, but I would have been more happy with another bowl of lobster poutine. 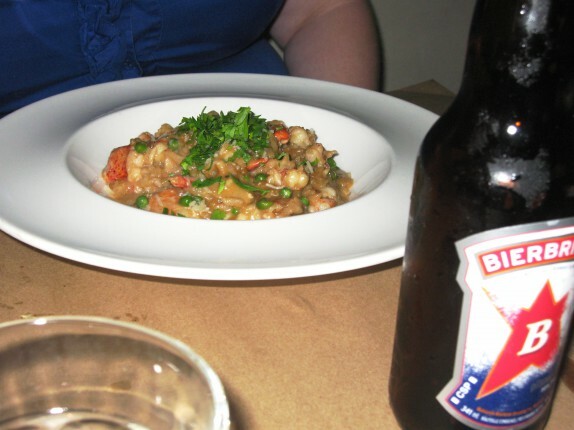 Cassie ordered the lobster risotto, the dish that “made Chef Hughes win Iron Chef America against Bobby Flay” and was also priced 25% higher than any other dish on the menu (not that price was even considered to be a factor for this meal). She wasn’t blown away by it, and, having taken a bite, I can back her up. It was very good, but fell a bit short. The fresh flavor of the peas was prominent in this dish as well, but the use of cheese was heavy-handed and masked the complexity of the lobster stock used to make the risotto. How do I know there’s supposed to be complexity? C’mon, why would they use a different lobster stock for this than the poutine gravy? 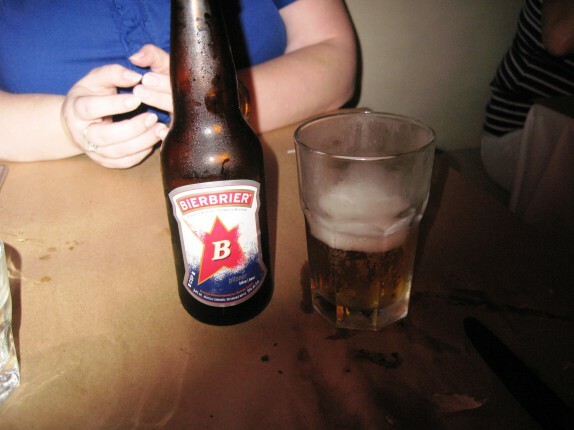 I ordered a local beer called Bierbrier. This was the first pilsner style ale I’ve had in a long time, and it did not disappoint me. It was crisp and refreshing. 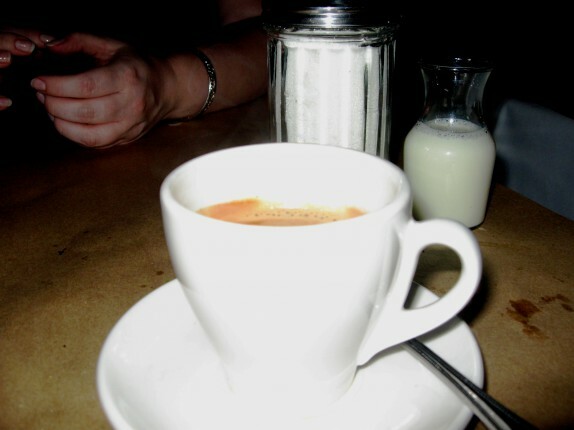 After the meal, I ordered a double espresso which came with a bit of warm milk. It was a bit long for a double espresso, so I used the milk to sweeten it. So I guess I had a self-mixed cafe au lait. 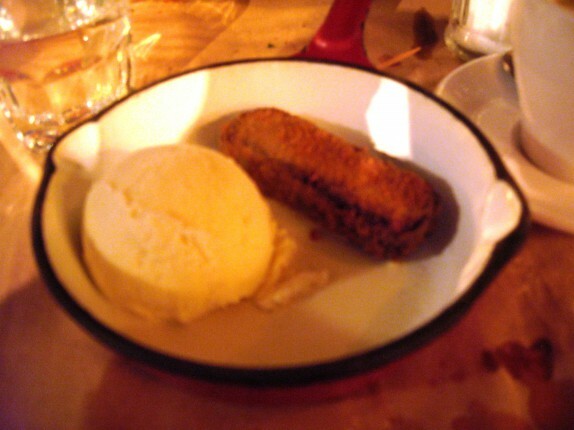 This was, of course, in anticipation of my dessert: the deep fried Mars bar with vanilla ice cream. What can I say? It was a great way to end our meal. Cassie ordered a warm brownie served with ice cream, and we shared both. 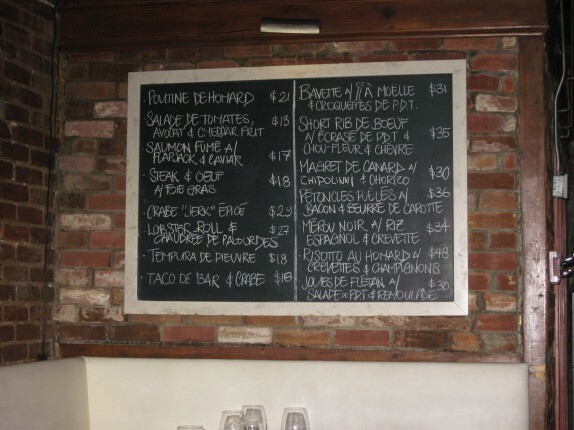 To sum up our experience dining at Garde Manger in Montreal: Amazing! I would go back in a heartbeat, but maybe next time I’ll stick to the left side of the menu. And order more lobster poutine! Next time: More of the underground city and some wildlife. Just curious what they charged you for the Caesar?